Narracan is a rural locality in eastern Victoria 14 km south of Moe. It was named after the Narracan Creek, and the word is thought to have been derived from an Aboriginal word describing a crow. The name Narracan has been applied to Narracan South, now Darlimurla, about 15 km away and to the Narracan Valley coal mine (1880s), renamed Coalville in 1887. It was also the name of a large shire (1878-1994). Narracan is close to McDonalds Track cut from Lang Lang to Morwell in 1862. 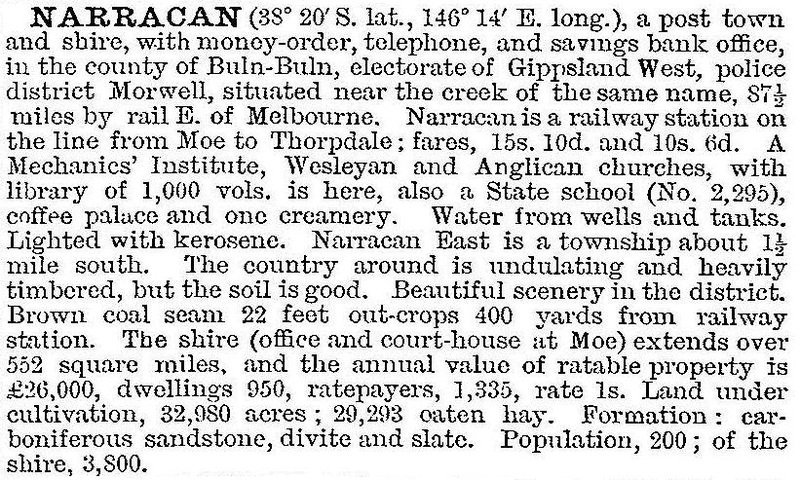 The earliest evidence of farm settlement at Narracan though was in 1874. A school was opened four years later in the new mechanics’ institute. In common with several fertile areas in hilly Gippsland ranges, Narracan underwent closer settlement in the early 1900s. Later experience required amalgamation of farm holdings, although less extensively at Narracan than at other places. In 1958 when the railway closed, the Victorian municipal directory recorded a hall, a church, a free library, a mechanics’ institute, a store and a school at Narracan. The next 40 years saw some of those amenities fall away, but the school has continued, with 18 pupils in 2014, and the mechanics’ institute hall was rebuilt in the 2000s. The Narracan East mechanics’ institute hall is at Gippstown heritage park, Moe. At the 2011 census, vegetable growing accounted for 5.6% of employment and other farming 11.9%.